medical systems that are small, successful, on time and on budget! Vast, centralised data systems are an unavoidable way of life for healthcare organisations and professionals. But clinicians, networks and staff also have immediate needs for software systems to support projects that are vitally important to them and their patients but do not fit within the mainstream mega-systems. 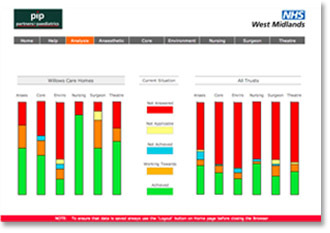 Using web based technology Worxinfo have successfully delivered systems spanning numerous Hospital Trusts and hundreds of clinicians, managers and administrators. In one example a Clinical Standards questionnaire produced high quality results that were presented at a Conference just six weeks after the project was launched. A major part of the success was the instant feedback provided to all contributors who could view their progress compared with all their peers.